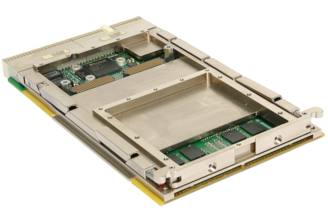 April 2015 – Concurrent Technologies has released TP B1x/3sd, a 3U CompactPCI® board based on 4th generation Intel® Core™ i7/i5 processor. Depending on the application requirements, two processor options are offered as standard: the 4-core Intel® Core™ i7-4700EQ at up to 3.4 GHz and the 2-core Intel®Core™ i5-4422E at up to 2.9 GHz. TP B1x/3sd is designed to give existing customers an upgrade path for long life-cycles with a useful performance boost compared to the earlier TP 702/38x which is based on a 2-core Intel® Core™ i7 processor running at 2.53 GHz maximum. 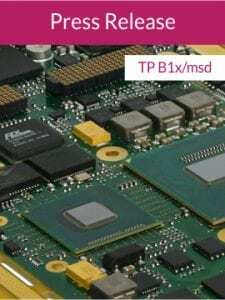 TP B1x/3sd is available with up to 16Gbytes of DDR3L-1600 DRAM with Error Correcting Code (ECC) and the memory is soldered down on the board for excellent reliability in adverse conditions. By manufacturing all board level products in house to IPC-610A Class 3 standards, Concurrent Technologies is able to offer flexible memory and processor combinations to meet customer needs with shorter lead times and without excessive minimum order quantities. For security sensitive applications there is the option to specify a Trusted Platform Module (TPM) along with Concurrent Technologies proven board level security package. Other optional software features include Fast Boot and Built-In Test firmware along with board support packages for popular operating systems like Linux®, Windows® and VxWorks®. There is an option to populate TP B1x/3sd with a high speed, removable Flash drive which is screw mounted for additional reliability. TP B1x has an optional XMC site, two Gigabit Ethernet ports, two SATA disk interfaces, USB Serial and General Purpose I/O (GPIO) expansion as well as optional graphics to the backplane. These rear I/O interfaces are backwards compatible with both the TP 702/38x and TP 402/35x series family providing an upgrade path from boards introduced back in 2008. Commercial and extended temperature versions of TP B1x/3sd are available and a ruggedized conduction-cooled version will be available shortly. The boards are particularly suitable for CPU intensive processing applications within the defence, homeland security, industrial control, and transportation market sectors. “TP B1x/3sd is the fifth board we’ve developed and released based on this generation Intel Core i7 processor to provide performance upgrades and life cycle extensions across a range of standard form factors. 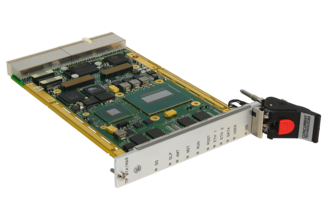 3U CompactPCI is still a popular format because it’s easy to use and is suitable for a wide range of markets including transportation”. The TP B1x/3sd processor board is released as a commercial air-cooled or fanless board and ruggedized variants will follow.